As the Dwarrowdelf cycle winds down (already!? ), we are taking the extra week to prepare for our end of cycle Top Ten lore cards. It's a tough one, believe me. So many cards, so little time. #014 Vilya Save Us, Master Elrond? News? The Hobbit: Overhill and Underhill is getting some article love. Check out the FFG website for info on the upcoming "Saga Expansion". While you're there, download v1.3 FAQ now available! 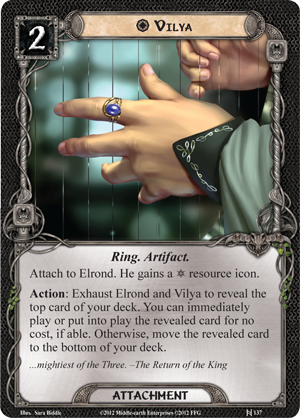 With the coming of the last AP in the Dwarrowdelf cycle, Shadow and Flame, we thought it prudent to discuss Master Elrond and his ring of power, Vilya (both packed in the AP). 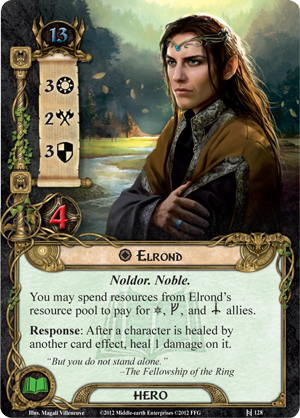 Hero card spotlight: Elladan and Elrohir, Hama and a little Aragorn (Lore) and the sword of kings. Then for a light hearted fan-expansion featuring Monty Python and the Holy Grail! Thanks to Chris for the submission! How about we get through Moria a little more? In part 2 of our scenerio-based live adventure, we find the fate of Balin's colony and make a harrowing escape! (The adventure starts at the end of Episode 11). Thanks for waiting on us, let's get right to it. We travel through the first 4 Adventure Pack scenerios and fill you in on points of interest and some fun facts about them. It's a heck of a journey so far. From The Redhorn Gate and through The Long Dark, we hope your adventures are filled with the wonders of Middle-Earth! Well, Sharkey, we have time once again to devote to the game we love! The clouds have cleared and fair weather is upon us once again. It's good to be back podcasting and we both want to thank everyone for the well-wishes and encouraging messages. They've really been uplifting. As I write this, Kevin and I have outlined a lite but fun comeback show getting us back up to speed with the goings on of the current - and soon ending- expansion set. Join us as we literally run the path of the adventure pack quests and smell a few roses as we catch up with everyone else. Copyright © 2011 The Fellowship of the Cards. All rights reserved.